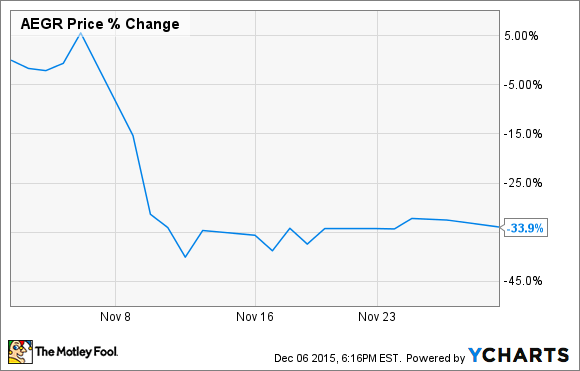 Aegerion Pharmaceuticals Lost a Third of Its Value in November: Time to Buy? Competitive threats to Aegerion's flagship medicine sent shares spiraling downward in November. What: Aegerion Pharmaceuticals (NASDAQ:AEGR), a small-cap biopharma developing treatments for rare diseases, saw its shares slip another 33% last month, according to data provided by S&P Capital IQ. This stock has now lost over half of its value from the start of the year. Aegerion's problems stem from the growing concern among investors that the newly approved PCSK9-inhibitors from Amgen (NASDAQ:AMGN) and Regeneron (NASDAQ:REGN), known as Repatha and Praluent, respectively, will eat into the sales of the company's competing therapy, Juxtapid, indicated for genetically induced high cholesterol. So what: Juxtapid is by far and away Aegerion's main value driver, given that the company's other approved product, Myalept, is generating less than $10 million in quarterly sales, according to the biopharma's third-quarter earnings report. So investors shouldn't be surprised that these significant competitive threats to Juxtapid are weighing heavily on the drugmaker's shares right now. Now what: Amgen and Regeneron's rival therapies are reportedly picking up steam and starting to pull patients away from Juxtapid. Making matters worse, there are several additional experimental therapies for ultra-high cholesterol under development by a diversity of biopharmas. Some of these developmental-stage medicines could hit the market by 2017. As a result, Juxtapid is more than likely going to see its market share continue to fall moving forward. Looking ahead, Aegerion needs to find a way to significantly diversify its revenue base before its cash flows start to dry up. But it's not entirely clear whether the drugmaker's acquisition of Myalept can deliver the goods in this regard. So until Aegerion does solidify its revenue stream, investors may want to look elsewhere for more compelling growth opportunities in the healthcare sector. Is it Time for this Biotech to Change Management?